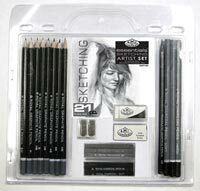 This dry media economical 21-piece set provides a collection of supplies for artists new to the medium. Fine artists usually begin with drawing, and this kits provides for a great foundation. It includes eight graphite pencils, an eraser, a kneaded eraser, a sharpener, three graphite sticks, three charcoal sticks and three charcoal pencils.